Client hereby hires and retains the services of James Roberts Fitness for a minimum of 3 months with a cancellation policy in effect. For all services to be rendered by James Roberts Fitness under this agreement. 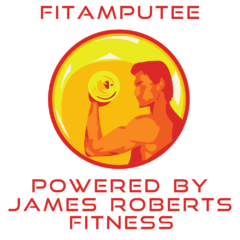 Fit Amputee powered by James Roberts Fitness shall be paid upfront every 4 weeks, weekly, or monthly paid via standing order every Monday. Sessions which are not attended will be lost. Sessions cancelled with over 18 hours notice will be able to be rescheduled manually but only for that same week. Sessions cannot be carried over to the next week. If you book a session and fail to show this is marked down as non-attendance and session is lost and cannot be carried over. The cancellation policy will be adhered to in all cases when the client is unable to attend including illness, work or family, commitments prevent attendance. Any sessions missed due to this without prior notification cannot be refunded. Cancelled sessions cannot be carried over. Cancellation of the programme; Client must give 28 days notice to cancel. James Roberts Fitness cannot refund any payments from clients who failed to notify us that they are discontinuing their programme. There shall be no refunds once sessions are paid for. If the client is not totally satisfied with the service and results then they may ask for a refund, it is at the discretion of James Roberts Fitness to refund the client based upon the implementation of their plan. The client understands the James Roberts Fitness membership is not a pay per session program but based on the entire service of James Roberts Fitness i.e. online coaching programmes, access to sessions, nutrition advice, membership website, Facebook group, seminars/events. James Roberts Fitness has conducted a questionnaire attached to this agreement but has carried no further tests on the client. The client confirms that he/she is in good physical condition, that he/she is capable of engaging in an activity or passive exercise and that such exercise would not be detrimental to his/her health and safety and physical comfort. If there are any problems with the client’s health, the client must gain permission from their GP before starting the program. The client must notify their trainer of any injuries 24 hours prior to the session. We cannot guarantee our service without any knowledge of injuries and for health and safety reasons cannot guarantee you can attend the workout without prior knowledge of the injury. – A new training programme every 4 weeks bespoke to the client and their goals. – 1 group call per week dependant on what programme the client is on, please note, if there are insufficient numbers in any programme then more time will be given in the 1-1 Skype feedback session. Nothing in this agreement and noting in company statements to the client shall be interpreted or constructed as a promise or guarantee about the progress or results of the client fitness program. E.g. specific weight loss & goals. This agreement sets forth the entire understanding of the parties and may not be changed except in written consent by both parties. It is understood by both parties that this agreement will remain legally binding.